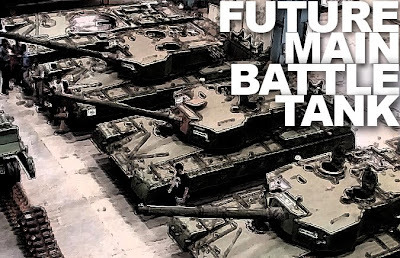 The Indian Army is still juggling concepts of precisely what it wants from its Future Main Battle Tank (FMBT), but information shared with LiveFist provides a rare broad glimpse into work very much in progress as far as qualitative requirements for the future platform go. The Army's FMBT wish-list, in no particular order follows. The Army insists that stealth be built into the FMBT from the ground up -- including paints/materials to provide limited invisibility in IR/visible spectrum and for scrambling and avoidance of detection. The Indian Army wants the tank to have an Identification Friend or Foe (IFF) system "to obviate chances of own tanks firing at each other in battle", and a whole new reliable and secure mobile communication system capable of data transmission, audio and video conference. Protection in the form of soft-kill system requires IR detectors, laser warning, radar warning and devices to instantaneously integrate these signals and control a countermeasure suite. Such systems are threat specific so all would have to be carried on a vehicle to gain protection against more than one part of the EM threat spectrum. The new tank necessarily needs to espouse hybrid electric vehicle technology and incorporate digital vehicle electronics (vetronics) to provide intra-vehicle and inter-vehicle communication capability that will greatly improve sit awareness and enhance operational effectiveness. For mobility, in order to achieve ‘extraordinary’ acceleration, the Army observes that it is necessary to couple the conventional diesel engine of the proposed tank to a turbine. The ‘Hyberbar’ engine will be able to accelerate from zero to full power at 1,500 hp in 2.8 seconds, while a conventional diesel engine requires 8-12 seconds. The quest for more compact power pack has led to renewed interest in gas turbines, which needs to be explored, the Army feels. The Army wants an active suspension system with sensors, control units, and a hydraulic power source in combination, to automatically alter the suspension characteristics to more closely match the speed of the vehicle and the terrain profile, especially in Indian terrain conditions. The Army has always held the view that signature management was almost completely ignored in the development of the Arjun. The Army hopes that lesson has been learnt now. Current and expected future threat scenarios require signature management measures of a multi spectral type, and they require an extremely short reaction time. The Army says it requires signature management in design measures, basic camouflage, additional camouflage and temporary camouflage. Explosive Reactive Armour Now! The Army points out that the main battlefield threats against tanks are Anti Tank Guided Missile (ATGMs), unguided anti tank rockets and grenades; shaped charge High Explosive Anti Tank (HEAT) gun rounds; Kinetic Energy (KE) gun rounds; and top-attack weapons like intelligent sub-munitions, terminally guided artillery rounds, etc. There is a need for developing Explosive Reactive Armour (ERA). Given optimised designs, integrated ERA offers tanks highly effective protection against both the penetrators of Armoured Piercing Fin Stabilised Discarding Sabot (APFSDS) projectiles and the jets of shaped charge weapons, including those with tandem warheads. The Army says it wants a high-performance armour system on its FMBT with advanced materials incorporating the following qualities (a) Reduced penetration by most lethal weapons, (b) Elimination of parasitic mass leading to a weight reduction, (c) Excellent corrosion resistance, (d) Inherent thermal and acoustic insulation properties. The Army has stressed that the FMBT needs Infra Red (IR) detectors, target identification systems, laser warning systems, radar warning receivers and devices to coordinate their signal and instantaneously control a countermeasures suite. These countermeasures fall into two categories: soft-kill system and hard-kill system. The soft kill sensors must discriminate true and false targets and they must discriminate between missiles or other rounds that threaten the vehicle being protected and those that will miss or are aimed at other targets. The Army wants an Automatic Protection Systems (APS) on the FMBT. The radar should determine threat levels adequately, and the self-defence rockets should not cause high levels of collateral damage, particularly to accompanying dismounted infantry. Of course, weapons. Conventional tube weapons are the product of a mature technology, and have now reached a high level of performance. However, on account of the gas-dynamic processes of thermally transformed powder, the muzzle velocity of projectiles is theoretically limited to approximately 2,300 m/s. Contemporary tank guns still offer a considerable growth potential, and electronic guns will be able to exceed this and become an attractive proposition. Tank-fired missiles, which carry shaped-charge warheads, were susceptible to various countermeasures, especially reactive armour. The Army says it is reasonable to expect development of high velocity KE missiles with heavy-metal, long-rod penetrators to defeat current and future tanks both within and beyond line of sight. Such extended-range missiles would enable armoured vehicles to engage targets beyond the direct fire zone. The high/medium-energy level (100 kJ) vehicle-mounted laser is expected to be a lethality option against rockets, air vehicles, light ground vehicles, antennas of armoured vehicles and electro-optical sensors. Hard-kill system to provide full-spectrum defence against top attack weapons, ATGMs, guided missiles and gun-launched KE and HEAT rounds. Fire Control System (FCS): Ground sensors, non-line-of-sight launch system and the network capability will enhance soldiers’ understanding of their situation in dynamic battlefield conditions by promoting a common perspective of enemy and friendly locations on digital maps and provide timely actionable intelligence. Very importantly, the Army has stressed that there is a need to manufacture modern simulators using lasers, micro-processors and magnetic tapes, thereby creating near actual combat conditions during training. Development of driving, gunnery and tactical simulators.